The St. Norbert College Green Knights wrapped up their 17th Midwest Conference title by knocking off Monmouth 10-7 on Saturday, ending the Scots two-year hold on the conference’s top spot. The Knight scored all 10-points in the opening quarter, then turned the game over to their defense, which forced six turnovers on the day. The Knights will find out their opening round playoff assignment on Sunday afternoon when the pairings are announced. St. Norbert College earned the No. 1 seeding in the West Region in the NCAA Division 3 Men’s Ice Hockey Tournament and will host a national quarterfinal game for the 17th straight tournament appearance. The Green Knights will host Augsburg University in a national quarterfinal game at 7 p.m. Saturday, March 17 at the Cornerstone Community Center in De Pere. The winner will advance to the NCAA Division III Frozen Four on March 23-24 at Herb Brooks Arena in Lake Placid, New York. The Auggies (18-9) knocked off Marian 3-1 on Saturday in Minneapolis in a first round game. This tournament appearance for the Knights will be their 18th. They’re 28-13-1 all-time in the NCAA tournament and with National Championships in 2008, 2011, 2012 and 2014. St. Norbert is 19-4 in its last 23 NCAA Tournament games dating back to 2008. Augsburg is making its fifth NCAA Division III Tournament appearance. the Auggies are 4-6-1 all-time, advancing to the Frozen Four in 1998. For the third straight week, the UW Oshkosh football needed a comeback in the Division 3 playoffs. Saturday, the Titans rallied from down 15 in the 4th quarter to force overtime where they got by Linfield (Ore.) 31-24. The 4th quarter comeback was capped by QB Nata Wara’s 2nd rushing touchdown of the game with under 8-minutes to play. Wara then hit Cory Wipperfurth for the 2-point conversion to tie the game at 24. After a blocked FG by the Titans at the end of regulation, the game winner in OT came when Wara connected with Caleb Voss. Oshkosh will play in the D3 semifinals on the road against St. Thomas (MN.) Saturday. A win, would send the Titans to the D3 title making it the 8th straight year a WIAC School would be in the championship. UW Whitewater has played in the previous seven winning four times, including the last three. Oshkosh is playing in the post season for the first time. The St. Norbert College Green Knights earned a share of their 14th Midwest Conference title and received an NCAA D3 playoff berth as they beat the Lake Forest College Foresters 20-10 Saturday. St. Norbert (8-2, 8-1 MWC) needed a win over Lake Forest (8-2, 8-1 MWC) and needed a Carroll University win over Illinois College in order to share the conference title with Lake Forest College. Green Knight sophmore quarterback James Tringali went 13 of 21 for 110 yards and one touchdown. Senior wide receiver Joe Green had 135 all-purpose yards, including an 11 yard touchdown catch. 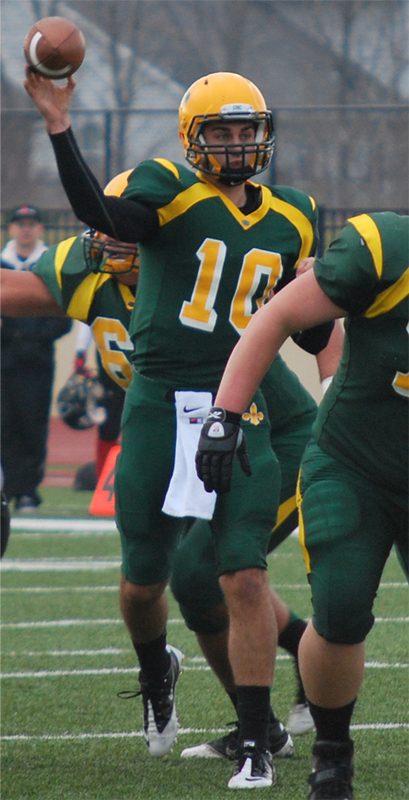 Forester senior quarterback Pete Scaffidi threw for 234 yards with one touchdown and one interception. Senior wide receiver Austin Sobey had eight receptions for 113 yards in the loss. St. Norbert now will await the NCAA playoff seeding, as the match ups will be announced Sunday afternoon.